Jackie Fo...Triathalete. I like the sound of that. But, I have to admit, I've been bit by the tri-bug, the fitness bug, the stay-healthy bug and I welcome it. I still claim wine and food my #1 love (besides Mr. Fo and my mom of course), but the energizing feeling that I get when completing a race or a really hard workout is hard to beat. 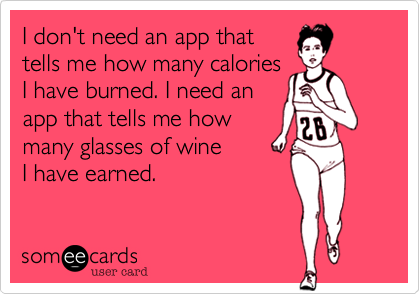 Plus, the more I sweat, the more I can eat and drink. As if that needed to be stated. So I first talked about this mini-triathlon in this post a few months back. Caitlin from the super fantastic (and Charlotte-based!) 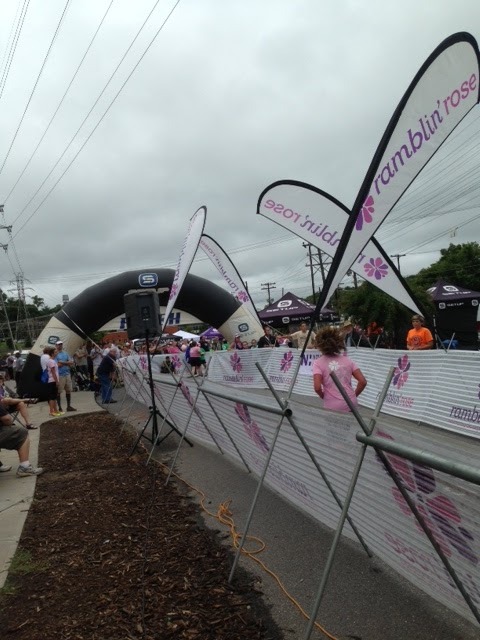 Healthy Tipping Point blog promoted the Ramblin' Rose Women's Triathlon Series. It's a beginner tri with manageable distances so I (and 2 friends) decided to take the challenge! We were of course nervous about the swim since we really weren't swimmers, but we practiced every week and soon enough the swim was a breeze. I mean, we're no Michael Phelps or Missy Franklin, but we can tread water at an average pace. As far as the rest of the training went, I spent time biking and running. Note to self, I regularly take spin class but riding a bike outside is way harder than using a stationary bike. Thanks to my sis-in-law Drew, I borrowed her bike and was able to practice a few times on the open road before race day. I always got annoyed with bikers because they got in the way of my car and caused me severe road rage, but biking is SO freaking fun and I would literally bike everywhere if it was at all feasible. I take back any harsh words I may have shouted at bikers from the safety of my own car. No more Judgey McJudgerson from my ivory tower. We got there in time for the transition clinic which I highly recommend for first-time tri-ers. Not only was the triathlon intimidating because I'd never swam or biked in a race setting, but the whole changing clothes concept blew my mind. What do I wear exactly? Where do I change my clothes? Where do I keep my stuff during the race? These are the things that kept me up at night. 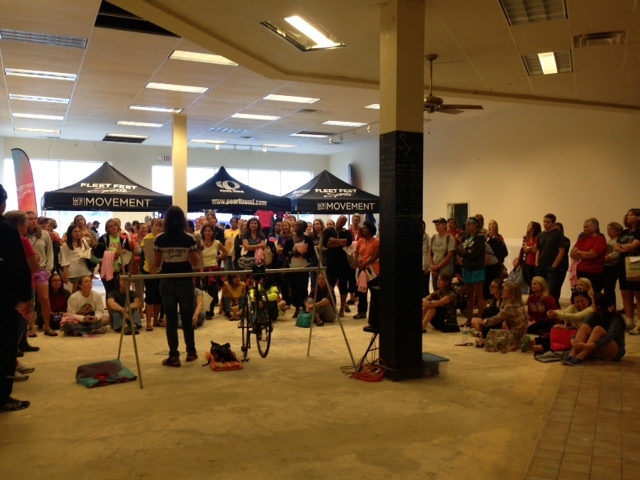 The transition clinic was filled with hundreds of first-time tri-ers asking a VERY patient woman a plethora of questions, but good lawd it was helpful. They even had a detailed map that showed where each event would take place. This probably helped people that aren't directionally and map-challenged (ahem, myself) but even I appreciated the effort. Then we checked into our hotel and figured out where we were going to carbo-load for dinner. 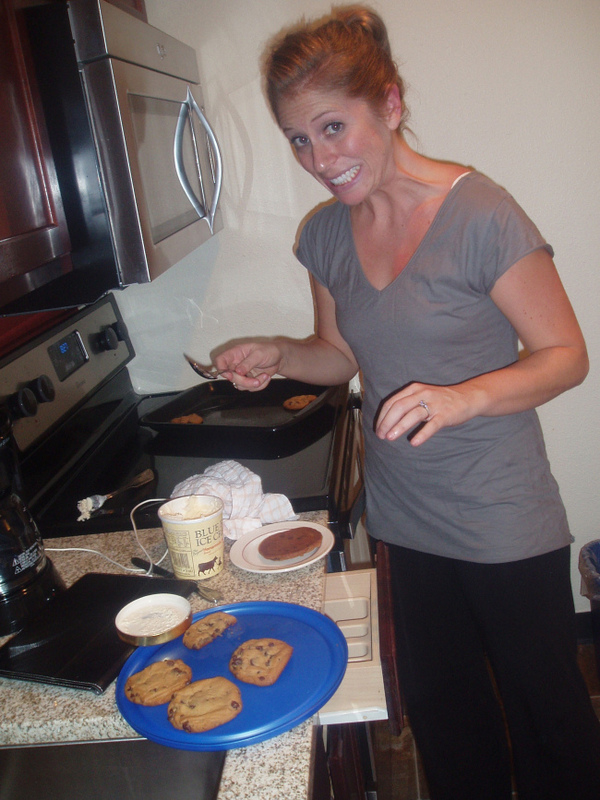 Note: Carbo-loading is totally not necessary for this race but it is necessary. If you get what I'm saying. 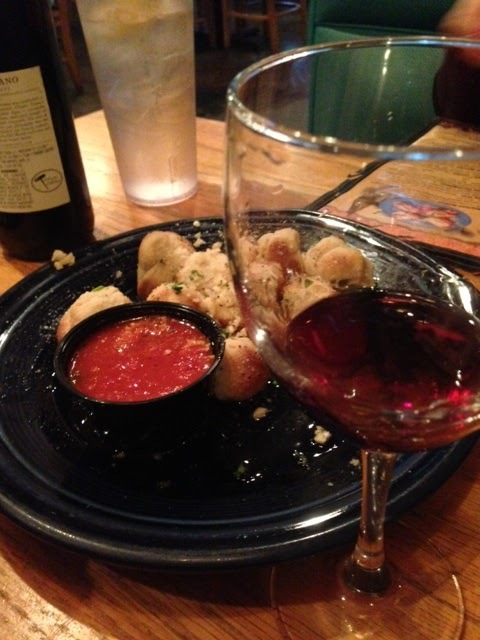 We went for Italian and had garlic knots, pasta and a leeetle bit of red wine. It's the dinner of triathlon champs. We were this close to getting a bottle of vino to bring back to the room but I give Amy full credit for being the voice of reason and saying no. 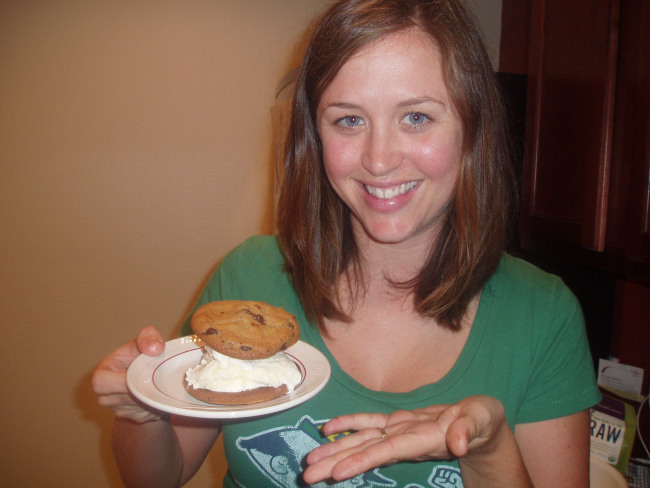 So we had a teeny-bopper sleepover filled with cookies, ice cream and magazine reading. You know, the type of sleepovers before we could drink wine. Ha! 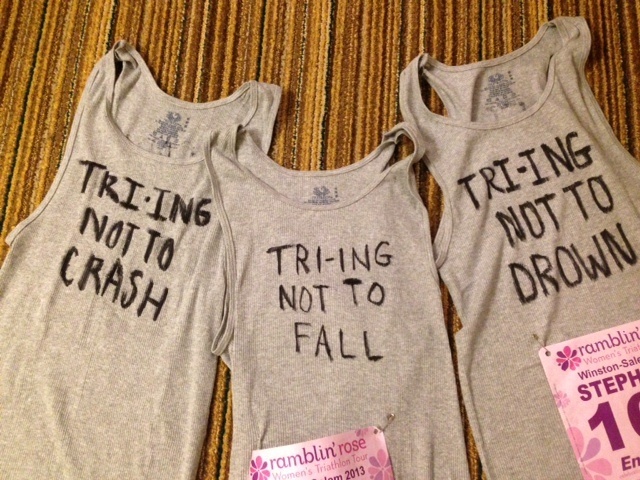 We also made our shirts, which if I do say so myself, were freaking awesome. We literally went to sleep at 9:45 p.m. It was a crazy Saturday night. When we woke up bright and early at 6 a.m., we had a pleasant surprise. 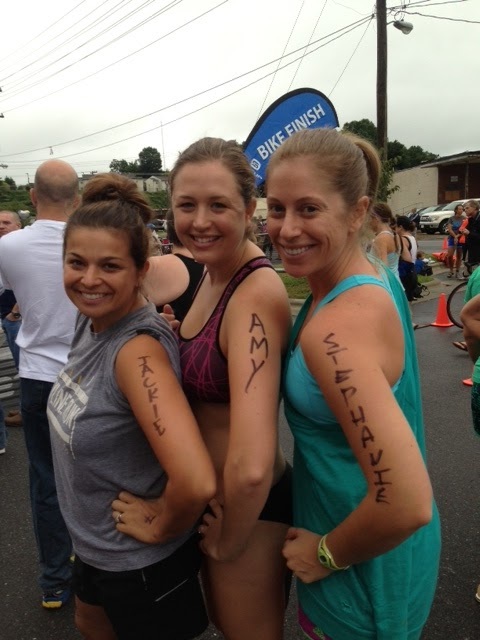 You see, one of the main components of a triathlon is that they write all over you with a black Sharpie marker. (I'm slightly exaggerating, but the smell of Sharpies was prominently in the air that day.) They wrote our swim ability number on our hands and we joked about how one of us would probably sleep with it on our faces. But we never thought it would happen. But it did. And at 6 a.m. with nerves in our bellies, we laughed and laughed. We got our stuff together and headed to the YWCA, blaring some Eminem to pump ourselves up. It worked. When we got to the Y, there were hundreds of people and excitement was literally vibrating in the air. As was the Sharpie smell I mentioned. The race was really, really organized with tons of volunteers there to answer questions. 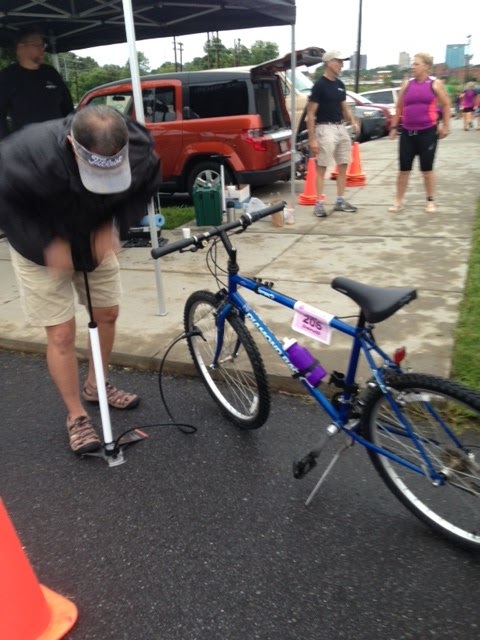 There was even a bike mechanic to check out your bike and make sure the tires were pumped up. My tires were low and the guys pumped them right up. So convenient! 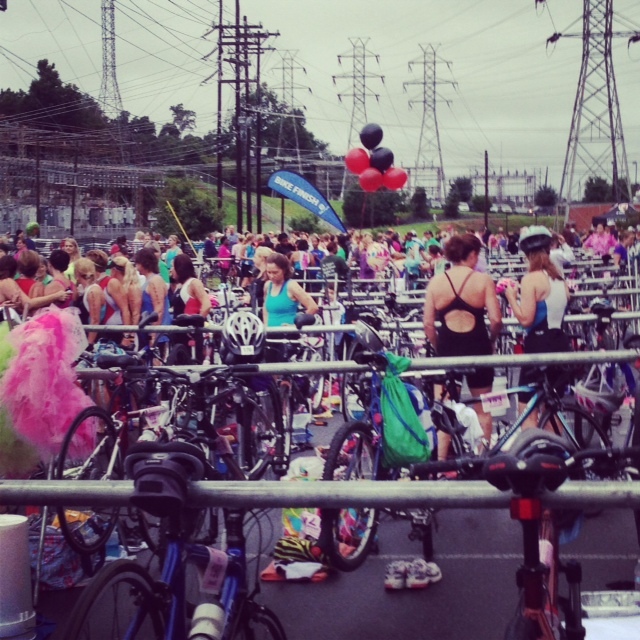 We headed to the transition area which was a sea of bikes. It was sort of intimidating but awesome at the same time. The bikes are organized on racks and the racks are numbered and corresponded with your race number. Are you wondering about the balloons? 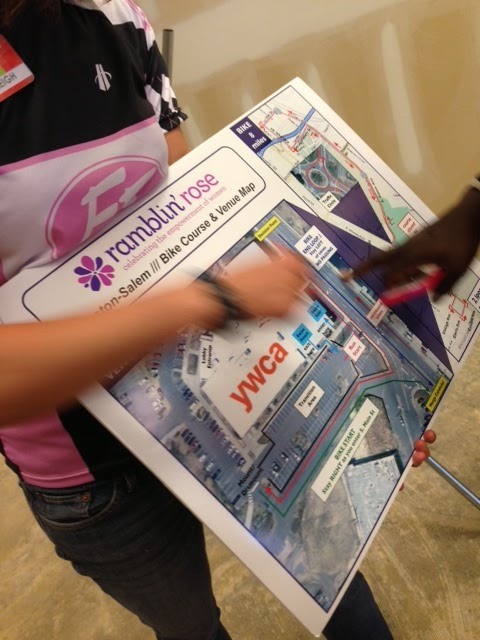 People use it to mark their bikes so they know exactly where to go to find their bike during the race. One of the volunteers told us that this is why the all-women races are so fun because guy would never do anything fun like balloons. I did see a lot of fun team shirts and even some tutus on the course. See, women really DO rock. As if I was unsure about that. I put my towel and race gear right next to my bike per the transition clinic's instructions. The point is to have everything out and easy access for transitioning to your next leg of the race. I would never have thought of that and probably would have been digging around in my bag to find what I needed. After we got all marked up, we got our swim gear on. Let me tell you, a bathing cap and goggles is just not a good look for anyone, but it must be done. No pictures of that. You're welcome. As we waited for the race to start, they made announcements and even played the national anthem with a big ol' American flag waving. I got a little choked up and forgot I was standing around in public in a one-piece bathing suit at 7:30 a.m. It was really special and inspiring to see all these women with their hands over their hearts. We were lined up in order of our swim ability and they started funneling us in to the pool. While we were waiting (we were all about in the middle of the pack for swim time) we started to see some of the really fast women transition into the bike race. 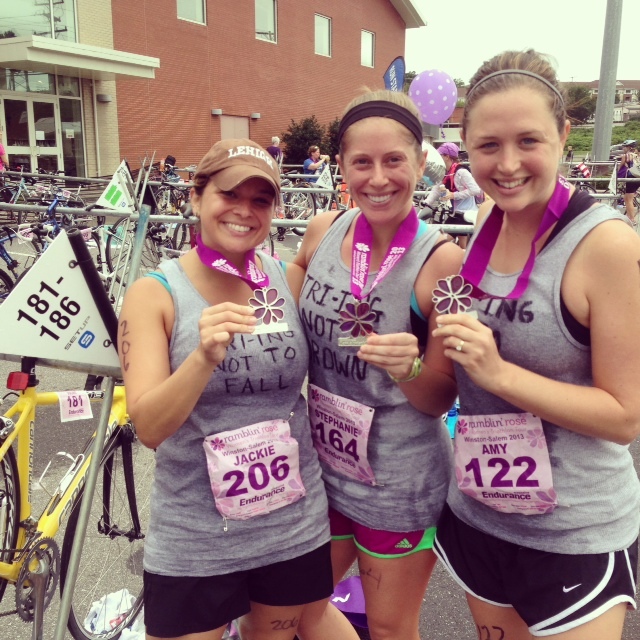 We were all cheering and in total amazement at how fast these women were! When it was my turn to swim, I hopped on the timing mat and jumped in the thankfully warm water. There were a few people in my lane which I had been worried about, but it worked out fine. The way they organized it made perfect sense and I swam without any flailing kicks or water splashes from my fellow swimmers. Even when I was under the water I could hear people cheering, which was awesome! I was happy to be done with the swim, but also surprised at how easy it was. I think I could have swam longer. 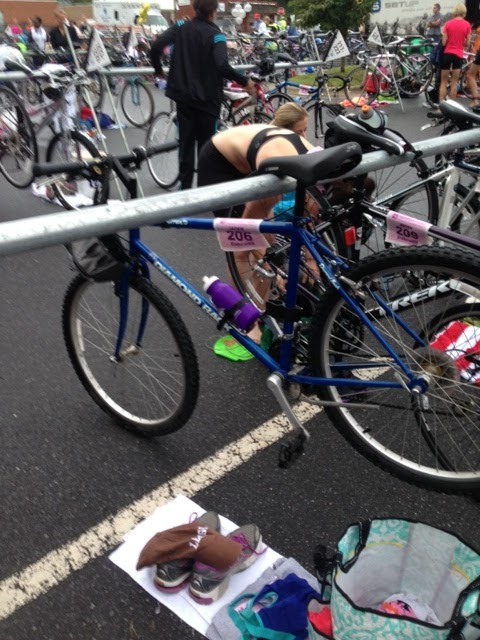 I moved on to the transition area and I have to say that transitioning from swim to bike was not my strong suit. I sort of forgot to dry off which made everything harder to put on. (i.e. putting on dry clothes on a wet body is not easy.) My transition time for this was over 3 minutes (longer than most peoples) which prompted Mr. Fo to ask me if I had taken a nap during my transition. Haha. I'll do better next time. I hopped on my bike and started the 2 loop course. I have to admit that I thought the bike would be the easiest part and it was the exact opposite. There were a few monster hills and I was struggggggling. But I just went slow and steady and even got "out of the saddle" a few times to get me up the hill. Everyone was extremely encouraging and even when people passed you they would say "you can do it, you're almost up the hill!" One thing I noticed is that my helmet was too loose. I saw my friends on the course a few times and Stephanie said one time she passed me and my helmet was literally on sideways. For next time I've got to fix my wonky helmet because while it's funny-looking, it's super unsafe to have it that loose. I was happy to get off the bike and start my run. My legs didn't feel to bad even though I thought they would after trekking up the hills on my bike. The run was shaded and on a greenway. It was really pretty and I almost enjoyed it - which I don't really ever say about my runs! The best part is when you got close to the finish line you could start hearing music, cheering and the announcer over the speakers. There's nothing more encouraging than that! When I finished I saw Amy waiting for me. The announcer shouted out my name as I crossed the finished line and I was smiling like a fool! At the end of the finish line ramp there were lovely volunteers putting the medal around the finishers neck and saying "Congratulations, you're a triathlete." To which I nearly cried and almost burst with joy and energy. I totes hugged the volunteer which was not normal, but I think she was cool with it. They had tons of water and refreshments after the race. 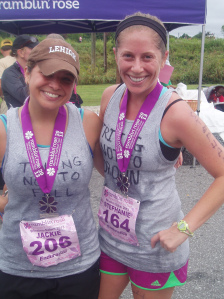 After I rehydrated I found Amy and we took some photos and cheered on Stephanie as she finished. 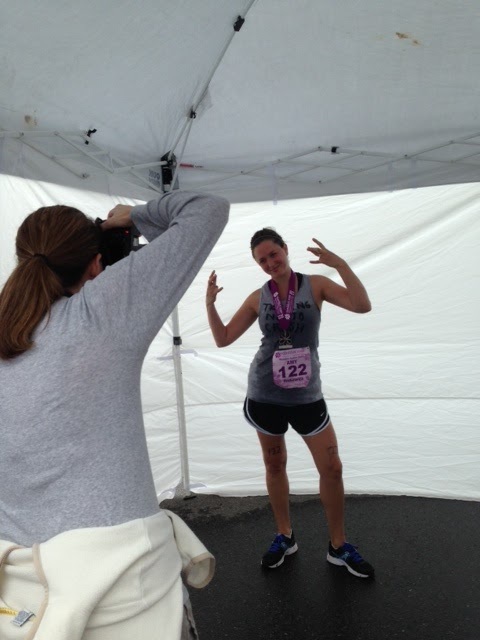 We wandered around the finish line area for awhile, taking photos and talking to people. We rehashed the race and all immediately agreed it was awesome, the swim was easy and we can't wait to do another one! Here we are with our medals and our sweaty red faced grins. We all met our race time goals. Based on my training times and not knowing how long my transitions would take, I tried to complete the race in under 1 hour 15 minutes and I did it 1 hour 11 minutes! I already have areas I want to improve in but for my first time I'm pretty happy. You guys. I can't say enough good things about this race, this organization and the amazing feeling you get after completing this! We were all really nervous but I promise it was all for nothing because we had the absolute best time, even with the bike hills! The volunteers were amazing and cheered you along the whole course, as did the spectators. At one point on the bike loop a whole group of people cheered out "you can do it Jackie!" and I was like whaaaaat! I love those people! The week before the race we all received emails with packing lists, tips, weather information, just about anything you could ask for. It was amazing to be part of a women-only event as well, and I was so inspired by all the ladies there. There were women of all shapes, sizes and ages which proves that ANYBODY can do this and ANYBODY can get in shape. And you can enjoy your food and wine too, as I have prove over and over again. Ha. If you think you are at all interested in doing a beginner triathlon, I encourage you to do this series. And don't be afraid of the swim! I know people are afraid of the swim (I was) but if you practice consistently you can swim this distance no problem. There are two more races in the series this year - one in Charlotte September 22nd and one in Chapel Hill October 6th. We are going to do the September 22nd one! What can I say, we are hooked! I have another big event this weekend, the wedding of Amanda and Collin, a really sweet couple that I've enjoyed working with for over a year! I'll be back next week with my wedding recap! Have a great weekend everyone! Go Jackie! So proud of you. I got a chuckle out of the bike helmet being sideways. I can totally see that and in true Jackie fashion, you were probably nonplussed. HAHA! This is not only hilarious, but also such a great summary of the race!! Great post JFo. 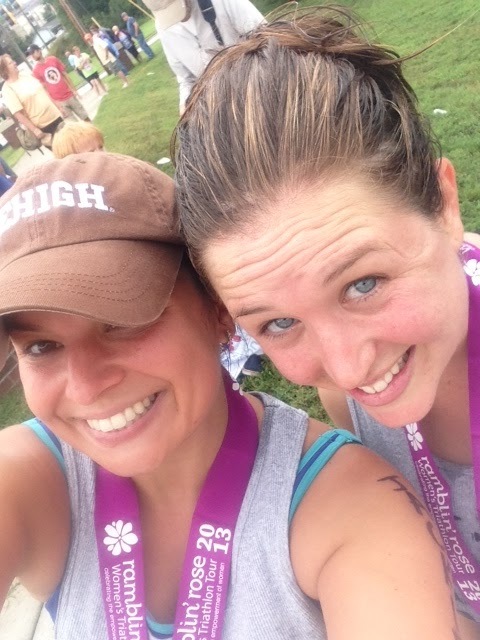 And while I should be livid at you for posting my sharpie face on your blog that thousands read, I am not because I love you and I can't wait to do another tri with you by my side! 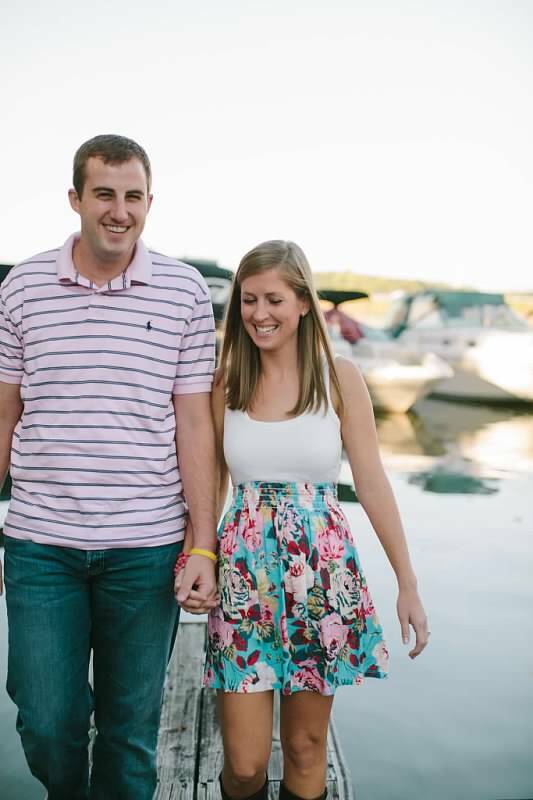 Amanda and Collin's Preppy Navy and Pink Wedding! Laurie & Matt Wedding Photos!